The Chinese proverb pictured above clearly illustrates that telling isn’t teaching. While engaging students through demonstration is far more effective than explaining, music teachers often do just the opposite, particularly in ensemble-based classes. This teaches students to be musical followers – to simply respond to a command – rather than being active participants in the music-making process. Modeling can effectively and efficiently teach and reinforce musical concepts while actively engaging students in the learning process, guiding them to strengthen musical decision-making skills, improve creativity, and develop as independent musicians. Movement sequences can model multiple musical elements, including beat, meter, rhythm, subdivision, duration, pattern, sequence, articulation, tempo, dynamics, phrasing, form, style, expression, and energy. The following video shows a movement sequence that models very simple rhythm patterns. The sequence starts and ends with a steady beat, first with the feet (which continues the entire time), then adding hands, to engage both the upper and lower body. Having students tap their heels instead of toes is more effective because it requires the use of a larger muscle. I used the heels of my palm rather than my palm because a room full of hands slapping legs sounds unmusical and feels unpleasant. The song is in duple meter, and all rhythm patterns are four beats long. The rhythm patterns are simple, but varied. 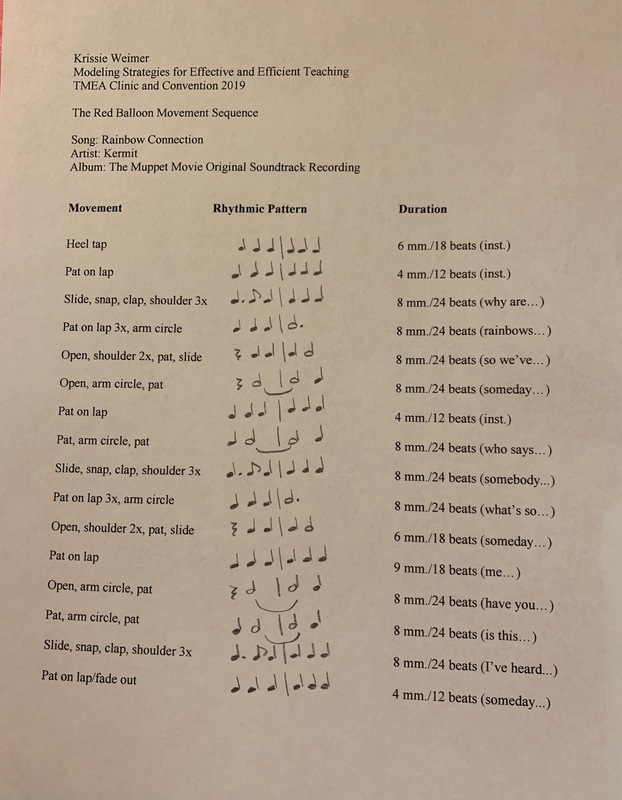 They show the duration of whole notes (arms in circles), half notes (slide on leg), quarter notes, and eighth note subdivisions (hand on lap patting to back of hand). Many beginning instrumentalists have trouble keeping a steady beat, sustaining pitches such as half notes and whole notes for their full value, and subdividing notes. Involving students in movement sequences allows them to experience feeling the steady beat, duration of sustained pitches, and subdivisions. Therefore, it is important that the motions reflect each note’s duration. Showing a snap for a half note would not make sense because it is a quick motion and a half note is sustained, therefore a slide is more appropriate. This song is straightforward, performed at an allegro tempo in Verse 1, Chorus, Verse 2, Chorus, Verse 3 structure. Each verse is four measures long, and the chorus is eight measures; the patterns followed this form. I chose the eighth note patterns for the longer chorus to reinforce the subdivision of the beat, using the same pattern and motions both times the chorus occurred. The song is also energetic and expressive, with a driving feel. The range of motions and delivery match the song’s style and energy. The next video shows another movement sequence, demonstrating many of the same ideas described above. This time in triple meter, and the rhythm patterns were pulled from a piece of beginning band repertoire. Each rhythm pattern in this movement sequence is from The Red Balloon by Anne McGinty. You can compare the lesson plan to the score seen at JW Pepper. 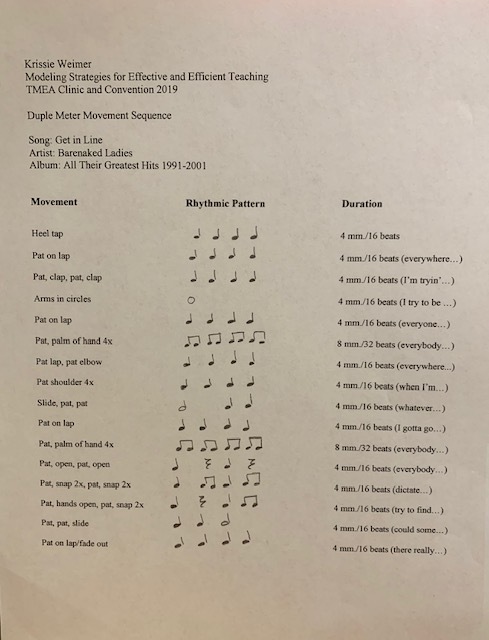 Using a movement sequence to introduce a new piece of repertoire is a great way for students to experience rhythm patterns, meter, style, and all musical elements previously discussed, prior to seeing the piece. Students feel and experience various rhythmic patterns that appear in the piece; even if those patterns do not appear in every part, they help students continue building a rhythm vocabulary. If students struggled with a pattern while rehearsing the piece later, a quick model of the movement associated with it will remind them; having students who do not play the part model the movement keeps all students engaged in the learning process. Use additional guiding questions as necessary to help students respond appropriately, especially if this is a new concept. You may then ask students to echo your patterns using decrescendo. Alternately they might pair up and do a call and response activity with their partner. Here, one calls a pattern using a decrescendo from beginning to end and the other echoes in imitation, or responds with their own improvised pattern. You can walk around and assess students, reinforcing as necessary. Next, show students what a decrescendo mark looks like. Tie it to literature to make a connection – an example in a method book, an etude, a piece of repertoire, etc. It may be a short example to start, or an isolated section in a larger piece. Have students identify the decrescendos, ask again how they should be performed, then have students perform the example. Play recordings, and as students listen ask them to give you a non-verbal response – a thumbs up or a hand raised – each time they hear a decrescendo in the music. Model correctly again, have students echo, and move on once they perform appropriately. Think spirally when modeling. Each time you revisit a musical concept add a layer of complexity to challenge students and help them build on previous knowledge and skills. For example, once students can perform the rhythm patterns in the first movement sequence shown create another one with similar, but more complex patterns. After establishing a steady beat, all patterns with quarter notes could become eighth notes, and all eighth notes could become sixteenth notes. Cognitive modeling focuses on demonstrating cognitive thought processes, or making thought processes visible. This helps students understand the critical thinking that guides musical decision making. To use cognitive modeling, demonstrate strategies with running commentary. Break down the strategy by showing the process. For example, part of your warm-up may be to have the ensemble play long tones, holding each pitch for 12 counts. You model for them, performing each pitch with a slight crescendo throughout, then state “we want to slightly crescendo through the pitch to maintain a strong sound for all 12 counts, without fading out.” You may even show a hand motion to signal a slight crescendo as you explain. After warm-ups you go to a piece of repertoire where the same technique is needed; much of the ensemble has sustained tones under a main melody. As the ensemble plays, you remind those with the sustained notes to slightly crescendo through them to maintain a strong sound without fading out like in warm-ups, showing the same hand motion you previously used. The key is to provide both an aural and cognitive model, showing both a performance and a critical thinking technique. The next time similar sustained notes appear in a new context you can relate it to the previous experience. 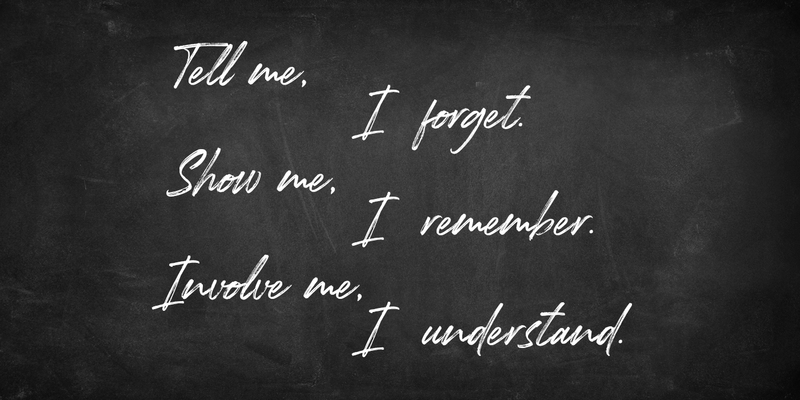 Ask students to apply the same strategy and have them briefly explain how they applied it. Students can also provide cognitive models. If you are working on a piece with some eighth and sixteenth note patterns that students tend to rush through, ask a student who consistently performs it in time how they stay in tempo. They may say as the line approaches they start subdividing in their heads du-de-du-de du-ta-de-ta, like you previously taught them. That student can model the thought process, the musical passage, then lead the class in subdividing the beat before everyone plays it. Cognitive modeling was described as part of the cognitive apprenticeship model by Weidner in a 2018 Music Educators Journal article, with similar examples described here. The article is referenced below. Modeling musical concepts by engaging students in hearing, feeling, and performing deepens overall musical understanding and facilitates transfer. Students gain improved listening skills and can analyze and reflect on their own performance, giving themselves appropriate and timely feedback. They can apply concepts, skills, and knowledge to unfamiliar music, strengthening connections between old and new material. Further, students can make creative decisions about interpretation and expression using appropriate musical elements. They can generate questions and solve problems. This can empower them to take responsibility for their own learning, and increase self-efficacy, motivation, and confidence. When we provide all feedback, observations, and corrections we do not allow space for students to be independent music-makers. Modeling in the ways described here help students develop an understanding of what musical concepts are, what they mean, and how to perform them in various musical contexts, guiding them on their way to achieving musical independence rather than musical dependence. Krissie Weimer is an assistant professor at the University of Texas Rio Grande Valley, specializing in instrumental music education. Dr. Weimer’s PK-12 teaching experience includes middle school band and general music, elementary general music, early childhood music, and elementary special education (behavior disorders). She has presented a variety of practitioner and research sessions at multiple state, national, and international conferences. Her research interests include music teacher mentoring and professional development. She earned degrees in Music Education from West Virginia University (B.S., M.M.) 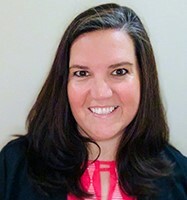 and The Pennsylvania State University (Ph.D.), where she was the 2017 recipient of the A. Peter Costanza Ph.D. in Music Education Outstanding Dissertation Award.